DEARBORN - Other Detroit suburbs have rolled up the sidewalks by 10 p.m., but Dearborn is popping with fireworks and foot traffic. It’s the last night of Ramadan, the holy month that observant Muslims pass with all-day fasting. Eid al-Fitr, which marks the end of fasting, is tomorrow, and life goes back to normal. For Hussein Charara, that’s bittersweet. After Ramadan ends, he can have lunch and a drink when he’s thirsty, but he loves the daily iftar feasts (the nightly breaking of the fast) with his parents, in-laws or, tonight, friends. 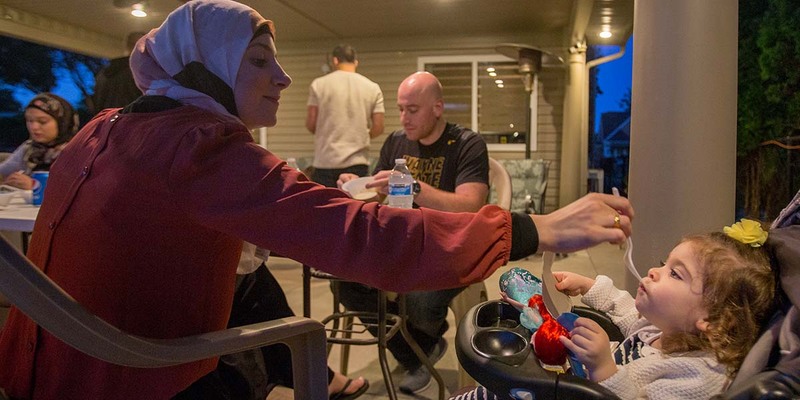 Two couples have come by, and one of them, Mohamed Cheaito and Amal Hijazi, have brought their son Adam to play with Madina, the Chararas’ 2-year-old daughter. Some day their second children will play together, too. Mariam Charara, Hussein’s wife, gave birth to a son, Emad, in March, and Amal is expecting in October. Which gives you an idea what the family’s life has been like in 2017. The news has been full of talk of Muslim bans and a president who says “radical Islamic terrorism” often. But in their part of the Dearborn bubble, life is less about politics than babies and mortar boards (Hussein graduated from Wayne State University in May). Table talk is about fantasy football and upcoming weddings. That’s part of why they live in Dearborn, where 40 percent of the population is of Arab descent. But outside of this community, the atmosphere isn’t always friendly, they say, especially for women who wear hijab, the Muslim headscarf. Read how Hussein and Mariam Charara felt in January. Hijazi is a neonatal intensive-care nurse in Detroit, and was recently informed a patient’s family had requested that “no Indians or Arabs” care for their child. All of the people at this table who voted, say they voted for Jill Stein, last November’s Green Party presidential candidate. None regret their choice.